ISS Progress 47 is shown docked at the International Space Station’s Pirs docking compartment prior to its departure Saturday, April 25. UPDATE (4/29 9:50 a.m. EDT): Docking has been called off for the Progress 59 spacecraft. Russian flight controllers are continuing to assess the vehicle and what the plan going forward will be. Additional information will be provided as it becomes available. UPDATE (4/28 11:00 p.m. EDT): Russian flight controllers are continuing attempts to communicate with and troubleshoot issues with the Russian Progress 59 cargo spacecraft as it makes additional passes tonight over Russian ground stations. UPDATE (4/28 9:35 a.m. EDT): Russian flight controllers have continued to try and recover telemetry capability with the ISS Progress 59 cargo craft this morning. The most recent ground pass started at 9:20 a.m. EDT and flight controllers reported no change in the issues with receiving telemetry data from the unmanned craft. The Russian flight control team attempted to command the vehicle over four orbits flying over Russian ground sites with no success. The next series of ground station passes is expected to resume late Tuesday evening. Teams are standing down on the Thursday docking attempt while Russian teams continue to analyze data and develop a troubleshooting plan going forward. UPDATE (4/28 8:15 a.m. EDT): Russian flight controllers are continuing to troubleshoot issues with the ISS Progress 59 cargo craft. 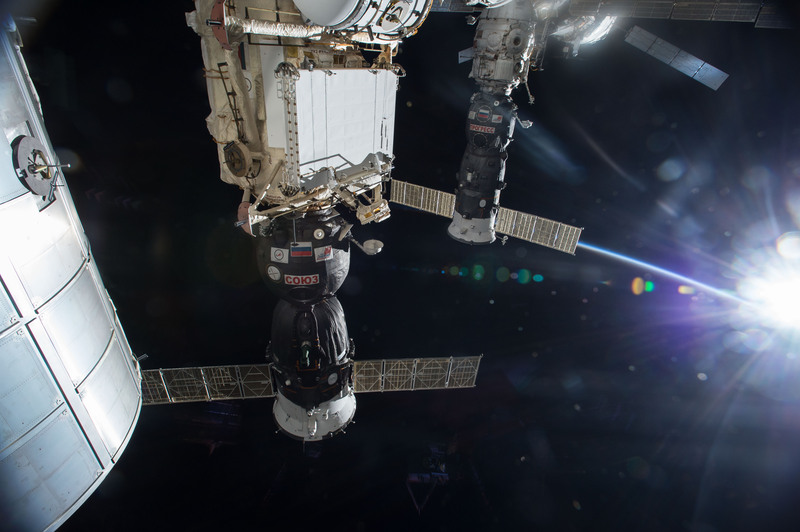 The spacecraft made another pass over Russian ground stations and continued to experience telemetry problems regarding the deployment of navigational antennas and the pressurization of the manifolds in the propulsion system. Flight controllers also confirmed that the vehicle had entered into a slow spin and have issued commands to attempt to control it. Carrying more than 6,000 pounds of food, fuel, and supplies for the International Space Station crew, the unpiloted ISS Progress 59 cargo craft launched at 3:09 a.m. EDT (1:09 p.m. local time in Baikonur) from the Baikonur Cosmodrome in Kazakhstan. However, Russian flight controllers initially could not confirm the health of the spacecraft’s systems and deployment of Kurs rendezvous and other navigational antennas. They selected the backup rendezvous plan with a targeted arrival Thursday for the cargo ship and its supplies for the space station crew. The Progress spacecraft is in a safe preliminary orbit. At the time of launch, the International Space Station was flying about 257 miles over northeast Kazakhstan near the Russian border, having flown over the launch site two and a half minutes before lift off. As Progress passed over Russian ground stations, the Russian flight control team issued commands through the telemetry system onboard the spacecraft in an attempt to receive confirmation that navigation and rendezvous systems had deployed. But, due to sporadic telemetry from Progress 59, inconclusive data, and trouble uplinking commands to the spacecraft, controllers were unable to confirm the status of the systems. Flight controllers will continue to look at the telemetry system to determine the overall health of the spacecraft’s systems. Instead of a four-orbit, six-hour docking later this morning as originally planned, Progress now will make a two-day, 34-orbit rendezvous with the station. With the two-day rendezvous, the Russian cargo craft is scheduled to arrive at the space station at 5:03 a.m. Thursday. Russian flight controllers are continuing to work to establish a good link with the Progress as it approaches the space station. Expedition 43 Commander Terry Virts and his five crew mates continue to conduct a variety of microgravity experiments on board the space station as they await the arrival of Progress 59. I would never wish one of the Progress ships to go awry, but, I know how engineers love a good problem. I am sure they all working long hours to find a solution and I wish them the best of luck to get Progress 59 back in the saddle again. I will be following along. Label under first photograph has the right day but the wrong date. Today is Tuesday, April 28. Thursday will be April 30. You might want to fix that. The only ground stations that can communicate with with the Progress vehicle are in Russia. Why are there no other stations to relay such communications? BIG RESPECT!!!! !GOOD WORK AND GOOD LUCK!!!!! Thank you for the honest updates….life is filled with struggles and challenges. And our ability and character determines the outcome. And subsequently the outcome and challenges build our ability and character. My thoughts and well wishes are with the crew and those who work to make this space exploration possible. So proud of what humans have accomplished in 2015. I wonder how many orbits it has before it falls below the level where it hits the atmosphere… and how many million $ it will cost to replace it. :-/ And I certainly hope they figure out how the malfunction happened, and how to prevent it in the future. BBC is reporting that ” a Russian cargo spacecraft is plummeting to earth” and that the point of impact is unknown… later clips as I researched you and others mentioned a wide geographical swath between “59 degrees & 59 degrees ” (?). Just thought you might like to get ahead of it. Good morning. Love you. Makes you want to get a lasso and haul it in, yee ha ! What a bad news for the ISS! But at least the astronauts do not need supplies for now… Best wishes friends! If they are not able to communicate with Progress 59, gravity will communicate for them and they have no way of directing re-entry. This could get interesting. That’s like a school bus falling out of the sky. Could it be possible on ISS to create gravitual situation as the same as being on the ground ? Around 8 pm, PDT, my cousin in Bishop, CA observed a vapor trail that obscured the rising moon momentarily, and the object continued on a SSE trajectory, and she described the vapor trail as remaining for some time. Could this have been the Russian cargo craft? Does anyone know if the Space X launches are scheduled to go to the ISS at any time soon? SpaceX has no plans to launch to the moon.